Our wonderful patients take the time to leave us postive reviews about their experience at our St. Louis optometrist and optical clinic. Please read some of the reviews we are very proud to receive. 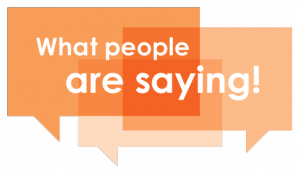 Please feel free to leave your own feedback after your experience at VisionCare Consultants. I cannot say enough good things about this place! I was blown away from the moment I walked in to the moment I left. Everyone was beyond helpful and kind. I was in a pinch and was totally out of contacts, and my glasses give me headaches if I wear them too long. I had called another popular Optometrist in the area and the receptionist was rude, short and just seemed annoyed with me, contrary to all the good things I had heard about them. Oh well, I decided to make an appointment anyways for the their very next availability. TWO WEEKS AWAY. Ugh. Fast forward to today, I read some good google reviews about this place (there were none on Yelp yet) and I give them a call and ask them if they could possibly get me in on Thursday since I knew I’d be off then, they unfortunately did not, but the extremely helpful receptionist asked me if I was free in about half an hour, they had an opening. YES PLEASE!! I was on my way. As soon as I walked in, I was taken back by how nice it was inside, they even had a fancy new-fangled coffee/espresso machine, score! The wonderful ladies reception were so nice. Dr. Brawley was phenomenal! So caring and thorough with me since I told him I hadn’t had an eye exam in almost 2 years and his aid/helper, Alicia was so nice as well. She was so excited to go over my “goody bag” with me, YAY FREEBIES! Overall, I will absolutely be recommending this place to anyone who will listen and as long as I have crappy vision, they will have a loyal patient/customer. Dr. Brawley was very nice and explained everything to me. I appreciated him taking the time. He did not appear to be in a rush like other places do sometimes. He waited until all my questions were answered. His staff was very friendly. I would recommend them to anyone. Excellent, timely, and friendly service. Comfortable and beautiful office setting. Huge fan of Vision Care Consultants. Staff is friendly and attentive. Dr. Friederich took the time to explain things thoroughly. The optical department helped me with the challenging process of picking new glasses. I found not only 1, but 2 great pairs of adorable glasses!! I was in serious need of up-to-date frames when I came in for an exam this past April. All of the staff were extremely friendly and made me feel welcomed, as this was my first time at this eye Dr. Especially the young man (I believe the Optical Lab Manager) that helped me with picking out the right type of frames. He was very knowledgeable with all the different brands and had me choose the ones I thought would make myself look the best. After going through about 8 pairs, I chose some Oliver Peoples frames that were a bit much out of my price range. He then offered up an alternative pair that were in a special order catalog that was like half the price and still just as stylish. With all that, taking the time for my needs and saving me money, I’ll definitely be going back to this office for many years to come. I was a first time buyer/wearer of glasses when I walked in. From the moment I walked in it was a great experience. It was a completely different atmosphere, the look and feel of the decor was very warm and pleasant. I’m so used to seeing glass places that I walk or drive by at the mall or in strip malls. This felt a lot more professional and classy. The receptionist was very nice. My doctor was very good. She was very calming. Dr. Wehner took a very simple approach and explained things very well. Then my technician was also excellent. He took me through the final tests and helped me pick out the absolute perfect pair of glasses. Actually, after talking to him, I ended up buying some prescription sunglasses (Cardinals Edition Oakleys) as well. I strongly recommend this place to anyone looking for eye care. I will only use this place for anything I need for eye care. Vision care consultants is the best! Dr. Wehner cares for my family, she is wonderful with my kids. So sweet! Great selection of eye glasses! Staff is always friendly. Dr. Friedrich and all of the wonderful staff at Vision Care Consultants have always treated me with excellent care. They do an outstanding job of explaining all of the options that are available to me, and do so in a professional, knowledgeable way. I used to see doctors at Clarkson Eyecare, but I never got the same doctor, and I felt like they didn’t even know who I was. When I switched, I noticed the difference right away. I feel warm and welcome right when I walk in the door. Dr. Friedrich knows me and my eyes. He asks questions and uses the latest technology to assess my situation and present all of the options that are available to me – glasses, contacts, and Lasik. And, his friendly staff provides all of the extra services that I never got at Clarkson. I can tell they want to make sure they’re providing me with the best possible care that they can. It’s evident they’re looking out for my best interests – they even explained how my vision insurance worked. I would highly recommend VCC for anyone who’s even slightly unhappy with their current eye doctor. I had a wonderful experience at VCC with Dr. Wehner and all the staff I came in contact with. Everyone was amazingly professional and helpful. I was made to feel welcome immediately upon entering the front door. Everything and everyone I came into contact with was knowledgeable, courteous, and willing to explain everything that was being done as part of my exam. All my questions were answered in a timely fashion and I never felt rushed or forced into purchasing something that I really didn’t need or want. I have a severe astigmatism and Dr. Wehner worked tirelessly with me to try to find the best fit along with the most improvement in my vision for contacts and eyeglasses. It took numerous office visits to try to get the best correction for me. I would highly recommend VCC to anyone looking for a new optometrist or wanting to change from one they are unhappy with. You just can’t go wrong at VCC!! I had a great experience here the first time I came. I brought my two kids and myself in for an eye exam. Everyone there was so nice and handled the kids great. I ended up getting a pair of glasses for the first time in 30 years, and the optician, Christian, I think it was, was very knowledgeable in suggesting the right glasses for me. My family was referred to Dr. Friederich at Vision Care Consultants a few years ago by very good friends. We have received really exceptional care during this time. Dr. Friederich has been a wonderful eye doctor for our family, but is also clearly a genuinely caring and very kind person. My son has had worsening myopia for a few years. Although my son has been very compliant and careful with his glasses, they were proving cumbersome with sports, swimming and being a 10 year old in general. He was offered something called corneal refractive therapy which involves wearing a rigid contact lense overnight, removing them in the morning and seeing clearly without glasses all day. This was not an easy decision to make, but Dr. Friederich was patient and thorough in his explanation. This is not an inexpensive therapy, but not cost-prohibitive either in light of all the benefits to an active child. We were given very clear and detailed information about the expense in writing before we proceeded. My son was given a great deal of encouragement at each visit relating to this therapy. I think the fact that Dr. Friederich is young and pretty cool has been a real bonus for both of my children. In addition to years of great experiences with planned care, this past weekend we received some extra special care for my son’s injured eye. He was hit in the eye with a ball and had some subtle vision changes. This happened on a Saturday afternoon. I was relatively sure that he needed to be seen in the emergency department, but wanted to be sure before we left home. I left a message on the after hours emergency line at the office. We received a very prompt and far past kind and patient return call from Dr. Seibel. He said that we needed to be seen and met us at the closed office at 5pm on a Saturday. It was an involved exam and he spent an hour with us. I never expected to be seen urgently by the practice. I was really impressed and so grateful to not spend an evening in the emergency department. I was also pleasantly surprised to be charged a fair price for this service that was equivalent to our emergency co-pay, but without all the inconvenience of an emergency visit. The Vision Care Consultants office is wonderful. The staff are always so friendly and I never have to wait longer than my scheduled appointment time. Dr. Friederich is not only a great eye doctor, but makes your appointment so fun. He answers all my questions and explains everything well. Love this place!